Coastal fishes of Southern Africa. Artist/Author: Heemstra, Phil and Elaine Heemstra. This up-to-date guide to over 400 species of the fascinating fishes along the coast of southern Africa and features over 600 original paintings showing changes with growth and sexual differences in colour of many of the fishes. The species accounts include useful descriptions and other information enabling easy identification and comparison of similar species. 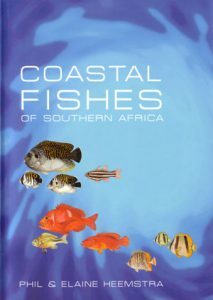 The book is intended to assist in learning more about the biology and ecology of southern African marine fishes. This book is a perfect companion to exploring the rich diversity of southern African shores.